You never forget your first time on a bicycle. That pivotal first dip into autonomy and accomplishment is only the tip of the iceberg of what the non-profit organization Community Bike Works in Allentown has set out to give their youth participants. Every year, a total of 300 students pass through the doors of Community Bike Works and take part in their flagship Earn-A-Bike program. At the start of the program, they pick out a bike from the non-profit’s collection of donated two-wheelers in various stages of disrepair and get to work. In 12 weeks, they spend their afternoons in small groups with three other students, youth volunteers or apprentices, and adult mentors tinkering away to make their toys as good as new. Another benefit of the program is that it also emphasizes the value of health and fitness, an important interest for children to embrace in a world of convenience foods where more and more of our entertainment and employment options come from technology that encourages sedentary behavior. Once the bikes are safe to ride, the children are outfitted with a new helmet and together, they tackle the trails in Trexler Park. However, exercise is just one piece of the puzzle. “We also try to teach healthy eating skills,” Schaffer says. Every week, a volunteer comes to give an afternoon cooking demonstration, providing the children with healthy snacks and knowledge to make smarter choices in the kitchen. Three months later, both the bikes and the children find themselves transformed. After students have completed the Earn-A-Bike program, they’re also eligible to participate in a host of other programs until they turn 18. Two of these programs are the Earn-A-Book and Afternoon Drop-In programs. In the Earn-A-Book program, students receive one-on-one tutoring and participate in reading and writing projects designed to nourish enthusiasm and competence in reading. After clocking 18 hours, they earn a trip to the bookstore where they can pick out a book of their choice. During the Afternoon Drop-In, students bond with their adult mentors in a less structured setting and participate in bike rides, field trips, visits from guest speakers, and arts and crafts. All of the programs are offered at no cost to the children’s families. Throughout all of the non-profit’s programs, the children and their development and potential remain the focus. “We’re not about the bikes as much as we are about the kids,” Schaffer says. She considers how often she hears from students that Community Bike Works is like a second family to be one of the organization’s biggest accomplishments. “Community Bike Works is all about the community,” says Michelle, a 12-year-old student who completed the Earn-A-Bike program. Now, she has returned as a veteran to take part in the Youth Leadership program. 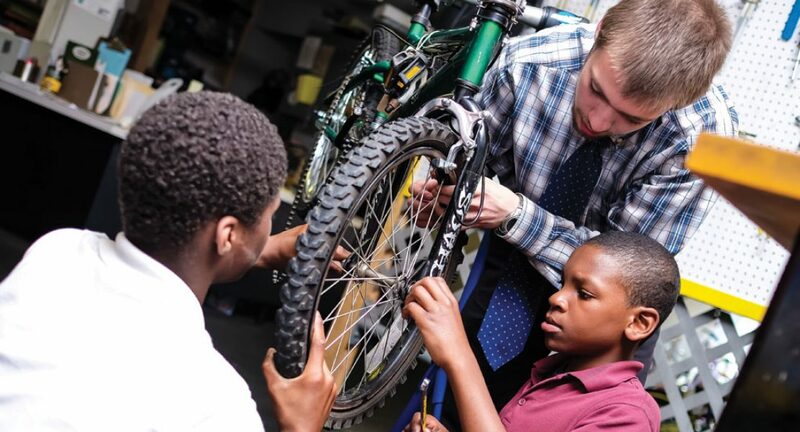 Once students earn their wheels, they’re eligible to return as youth volunteers, where they receive additional training on bike mechanics and leadership, as well as the chance to give back to the non-profit. The capstone of the organization is the Youth Apprentice program, in which youth volunteers like Michelle return once they’re at least 14 years old earn their very first paychecks as Community Bike Works staff members. At Community Bike Works, children are equipped to grow into valuable members of their local communities, and it’s because of also these communities that such growth is possible. To learn more about how you can get involved with Community Bike Works, visit them online at communitybikeworks.org or call 610.434.1140.